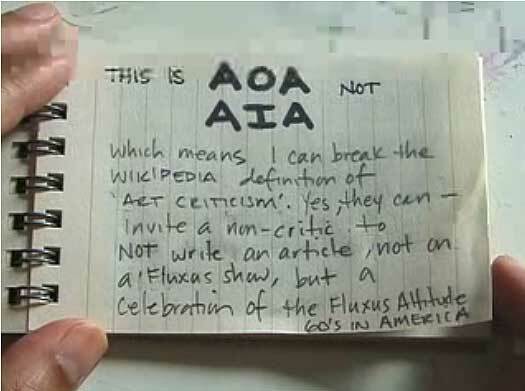 It’s been a while since I contributed to AOA. I waited until I found the right event that would correspond with a video letter. What better project than a Fluxus exhibition. Moreover, the first historical Fluxus show in France, ever. The organizers embarrassed to admit such a fact, explained in the press release, the reason lie in the fact that the two main French Fluxus artists, Ben Vautier and Robert Filliou were little exhibited and therefore, why showcase a movement which excluded the French? Hmmm, I’m waiting for my Carte de Sejour (or ‘green card’) so I will not publicly comment on their reasoning. ‘Soudain l’été Fluxus’ (A Sudden Fluxus Summer) on display at Passage de Retz in Paris until September 20, highlights a great movement in art making and another boat I missed. In the spirit, I respond.